How does a closed loop artificial pancreas work when you DIY? 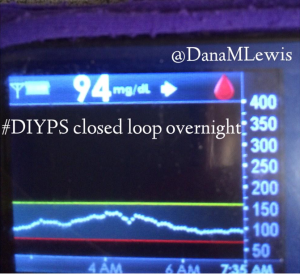 Or: #DIYPS closed loop is working! 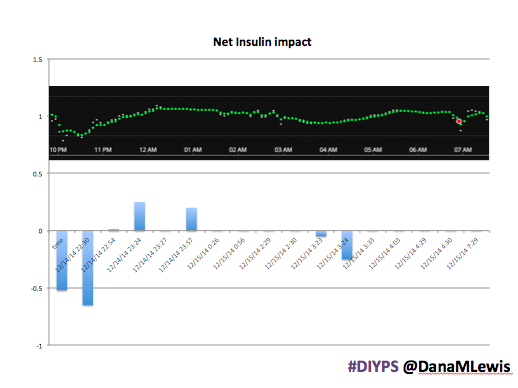 Over the past year, we’ve been using #DIYPS to process BG, insulin on board and carbohydrate decay in real time. This yields real-time predictive alerts of three kinds: more insulin needed (X.X units of bolus insulin); less insulin needed (temp basal to zero insulin for X minutes); or carbs needed. Using this algorithm and my data entered (insulin taken or reduced; carbs ingested); we’ve seen significant results not only for the first 100 days, but also sustained over an entire year for improved average glucose, improved a1c, and improved time in range. 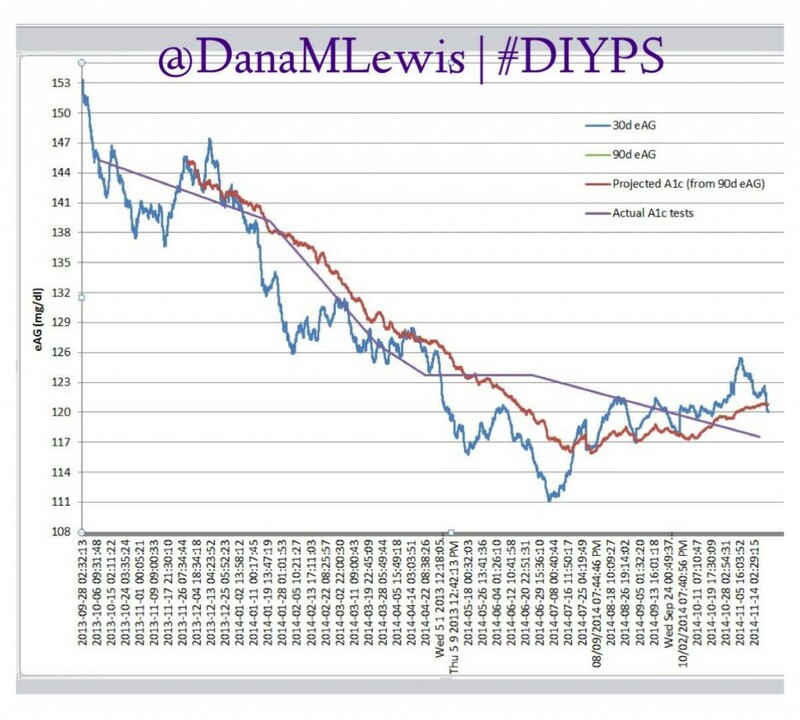 Three weeks ago, we mentioned at D-Data Exchange 2014 that we were planning to close the loop with #DIYPS…by August 1 (our wedding date :)). The FDA was even in the room. Two weeks later…we closed the loop. Once we established that the Pi/USB setup could read from the pump, we started connecting #DIYPS to the system to close the loop. Normally, #DIYPS provides 3 types of recommendations (see above). We reconfigured it so that while “looping”, it only enables the pump to do temporary basal rates instead of boluses. If #DIYPS says I need more insulin, it tells the pump to begin a temporary basal rate for 30 minutes above my normal basal rate. If #DIYPS says I need less insulin, it tells the pump to begin a temporary basal rate lower than my normal basal rate for 30 minutes, effectively reducing my net insulin. When something changes and I need to do more or less insulin, #DIYPS tells the pump to increase or decrease the temporary basal rate, or resume my normal basal rate. Note: there is a maximum basal rate that the pump can provide. This is a safety check so that #DIYPS cannot recommend a seriously dangerous basal rate. 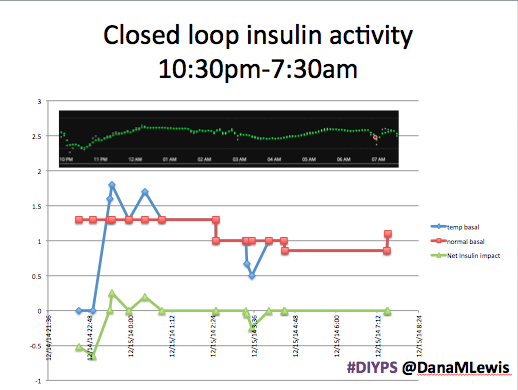 In fact, if I need more insulin than #DIYPS closed loop can safely provide using a 30 minute temp basal, the system will alarm and alert me to that state (although I usually already know about it). Same for if I was dropping fast and needed carbs in addition to reducing insulin; it would alarm and recommend carbs above and beyond reducing insulin. As you can see, the outcomes are awesome. In fact, they are better than I expected! You can see that around 10:30 (not pictured, but in the graph), I was running low and needed some temp basals to zero, then later some higher temp basals to accommodate the resulting rise in BG. Later, my normal basal rates sufficed until another point overnight when I needed less insulin to prevent a low. While this is 1/9 or so example nights, this is pretty much how it works every night. BGs drift up? Temp basal higher (usually 1.6 or 1.8, which is <=.5u above my normal). BGs drifting low? Temp basal lower or in extreme cases to zero to prevent a low. 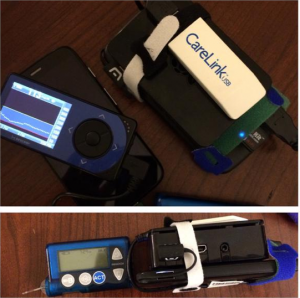 What happens if the closed loop artificial pancreas fails/stops working? If the loop stops working*, #DIYPS continues to work normally (processing all data and pushing recommendations), and my pump goes back to my normal basal profiles after any existing temp basal rates expire (which would be a max of 30 minutes). No big deal and no more dangerous than I would be walking around with my pump acting normally. *I’ve found numerous ways to make the system stop working: no battery power; being too far away from the USB stick so the pump can’t communicate; no cell signal to provide wifi as a hotspot to the Raspberry Pi; if the pump battery goes low, RF gets turned off and the USB can’t talk to the pump; if there’s no cell signal or wifi at all, I can’t upload CGM data to #DIYPS anyway; if the SD card gets corrupted inside the Raspberry Pi; etc. So, there’s many points of failure. But it doesn’t matter. 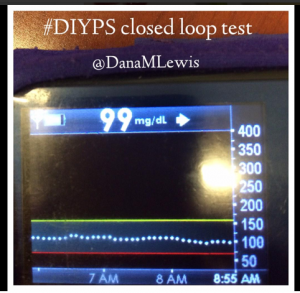 #DIYPS closed loop is safer for me (disclaimer: just me! I’m the only one doing this as a personal experiment to my own body) than if I just had a pump and a CGM, because it can reduce insulin and prevent lows. And it can increase insulin slightly and prevent rebounds. The target BG is especially awesome, because we have the closed loop targeting a BG of 115! It’s also worth noting the reduction in alarms. Remember, I sleep through CGM alarms, so we built #DIYPS. 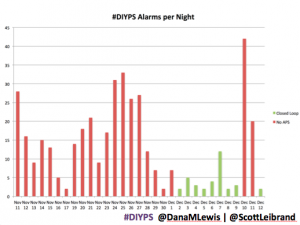 #DIYPS makes a lot of alarms – sometimes upwards of 40 a night (those are really bad nights!). 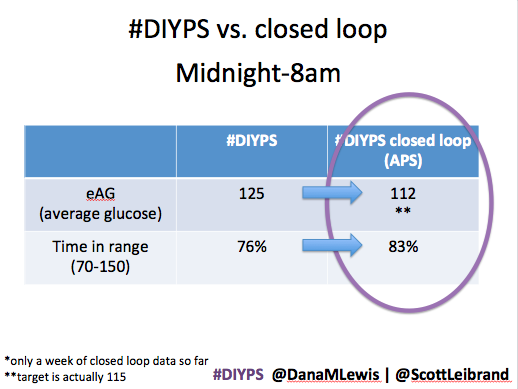 With the closed loop nights, there are very few alarms..and they’re usually alerts about things #DIYPS closed loop is taking care of on it’s own (see all of those no-hitters above!). We’re going to continue and iterate on the closed loop and keep making it better. I’m definitely going to keep using it overnight – it’s like having a working pancreas, the kind where you can go to sleep without fear. 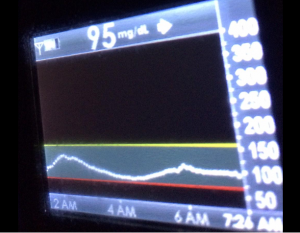 … and you can control overnight BGs solely using simple adjustments of insulin rates. 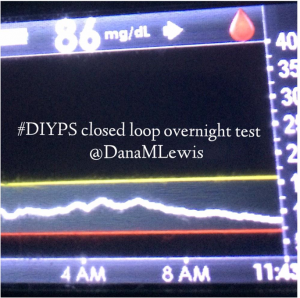 Thanks to everyone who made it through a really long post, and for the MANY people who have contributed in various ways to helping us close the loop with #DIYPS! Also, let us know what questions come to mind that we haven’t managed to answer above about how the system works, results, etc. As I’ve said many times, last year we set out to create a louder CGM alarm system. By adding “snoozes” so I didn’t drive my co-investigator crazy, we realized I might as well enter what I was doing, and be precise about it (aided by some quick bolus and quick carb buttons that made data-entry not the chore that it sounds). Thus, we had the data and the brains to realize that this made for some great predictions; much better than what you usually see in diabetes tools because they rely only on your insulin sensitivity factor (ISF) and correction rate, but don’t take into account carbs on board and their impact over time, etc. 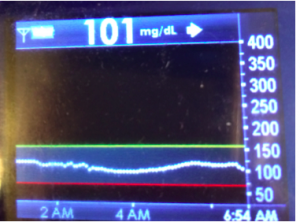 After I had spent 100 days using #DIYPS, Scott and I stopped to look and see what the impact was. For the long version, read this post about the results and the direct comparison to the bionic pancreas trial data that was available then. The short version: #DIYPS reduced my eAG and a1c significantly, reduced lows, reduced highs – aka my time in range was improved from 50% to regularly 80+%. I can’t attribute these outcomes directly to #DIYPS alone, but I do believe they’re highly correlated. It’s hard to separate other contributing factors like the fact that I have more boluses per day using #DIYPS (which other studies have shown decreases a1c); or the fact that I spend less time high/low because with #DIYPS I actually can wake up at night and take action before I’m high or low. #DIYPS is currently n=1 (meaning one person is the study’s subject). But what is significant is that I have year’s worth of data and actual lab-tested a1cs that shows the outcome of this type of artificial pancreas work. And it (to date, but coming soon / OMG this week!) hasn’t even been closed loop – I’m still the “human in the loop” making decisions and pushing buttons on my pump.Compared to the bionic pancreas and other artificial pancreas study trials where they have a few days and a few more (usually n=20 or so) subjects; they can look at the decrease in lows and highs and improved eAG…but they can only project what the a1c improvement is going to be.We’ve shown the improvements in lab-tested a1cs – see my graph above? Scott and I are not the only ones working on a closed loop. The community of developers connected to the Nightscout community has nearly two hands full of people who are working independently on device interoperability to close the loop by freeing our data from devices and enabling us to work with our own algorithms regardless of which hardware device we use to support our diabetes management.When all of these n=1 studies add up, it matters. At some point in the near future, after we’ve closed the loop with #DIYPS (ah! this week! :)) and others have as well, we may have more n=1 hours on closed loop artificial pancreas systems than the (traditional) “researchers”. Scott and I are hoping that we can not only show the world how open source innovation and new regulatory paradigms can deliver safe and effective results for people living with T1D faster than traditional medical device development and traditional regulation; but that we can also change how all successful medical device companies approach interoperability, and how traditional medical researchers do research – possibly in partnership with patient researchers like us.